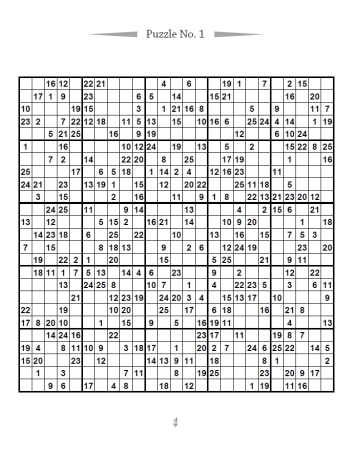 Welcome to this fantastic collection of 100 ENORMOUS sudoku puzzles, in a large 25x25 grid size. 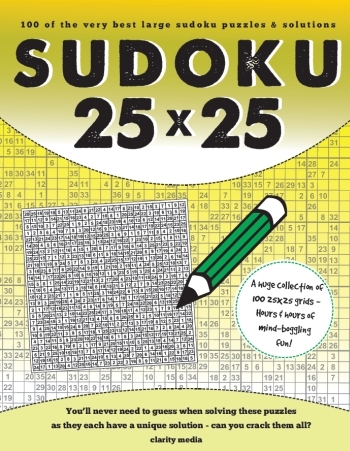 If you're a fan of traditional 9x9 sudoku but need an extra challenge, look no further. Perhaps you've already advanced to 12x12 but need something a little more testing? If you still feel you can go bigger and better- this is the book for you! Place each number from 1 to 25 exactly once in each row, column and 5x5 bold-lined box. You'll never need to guess when solving these puzzles, and they each have a unique solution. Can you solve them all? Click the sample link below to see how you get on and let us know! We love to hear from you. All of our puzzle books are printed on very high quality paper, making the puzzle experience all the more enjoyable! Please do let us know what you thought of this large grid size. We want your feedback!